Remove impurities and toxins from your skin and reduce the appearance of pores, fine lines and wrinkles with the detoxifying power of charcoal and kaolin clay. 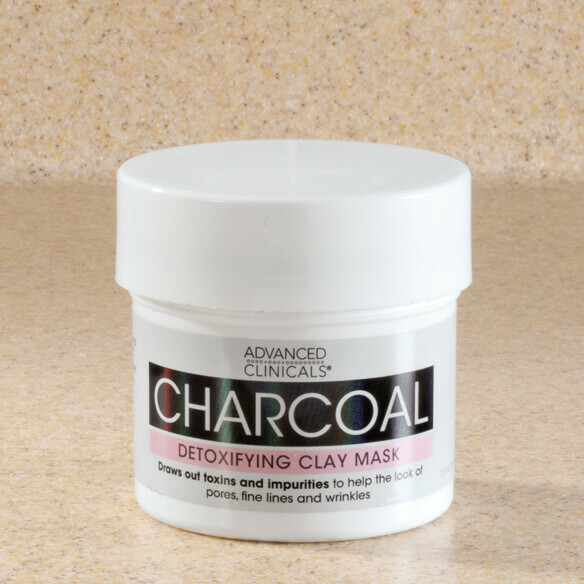 The Advanced Clinicals® Charcoal Detoxifying Clay Mask combines charcoal, green tea, and witch hazel to cleanse, nourish and soothe dry to oily skin. By sloughing off dead skin cells to deeply clean and purify, the detox face mask promotes brighter skin and a more even complexion. Kaolin clay absorbs deep into skin tissue, refining skin tone and transforming dull tired skin. The formula targets dead skin, dirt and oil, leaving healthier and smoother looking skin. With each mask, you’ll reveal a purified, even, more radiant complexion. To use this face clay mask, first cleanse and dry face. Apply a smooth even layer onto face, avoiding eye area. Leave on for 10-15 minutes and then rinse off with warm water. Use 2-3 times a week for best results. 5.5 oz. Cleanse and dry face before application. Apply a smooth even layer onto face avoiding eye area. Leave on for 10-15 minutes and then rinse off with warm water. Use up to 2-3 times a week for best results. Heard my friends talking about thought I would try it.